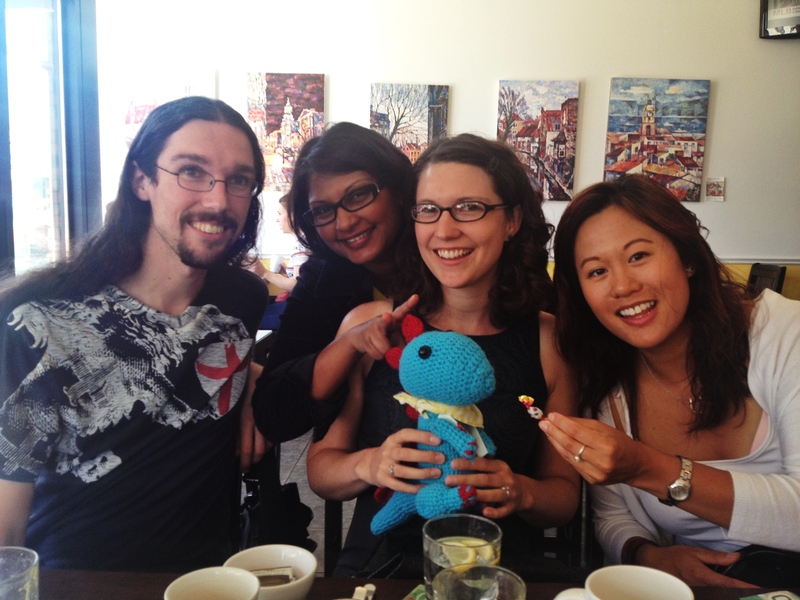 Brunch is an excellent way to start your birthday weekend and taking a page out of my book, KT invited a few friends out to Figs Breakfast & Lunch at Queen and Parliament. It’s hard to miss Figs with is cheery yellow sign, in fact every time Vanessa and I would plan a stroll down to Leslieville we’d make a mental note that we had to try this place before we turned the corner. 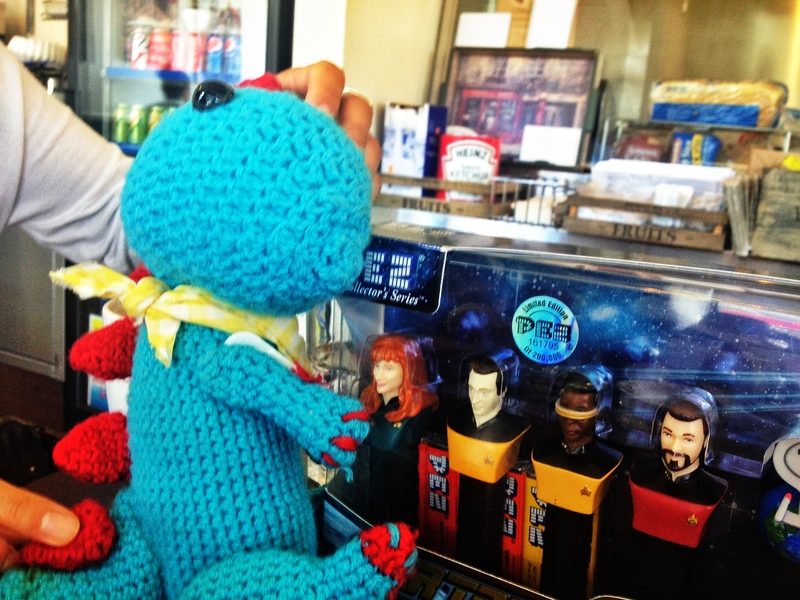 What can I say, he loves him some TNG! The worst part of an omelette is getting to that egg bit that didn’t any love and nibbling into something super bland. They did not have that problem here. The omelette was equal parts filling and egg (BRUNCHOSAURUS APPROVED) and well seasoned all the way through! The only thing I wish they had was the option to have spicy sausage. I think it would have given the dish a little extra kick! Dave had the 3 Eggs any style (4$!) but challenged the kitchen to a 4 egg omelette. 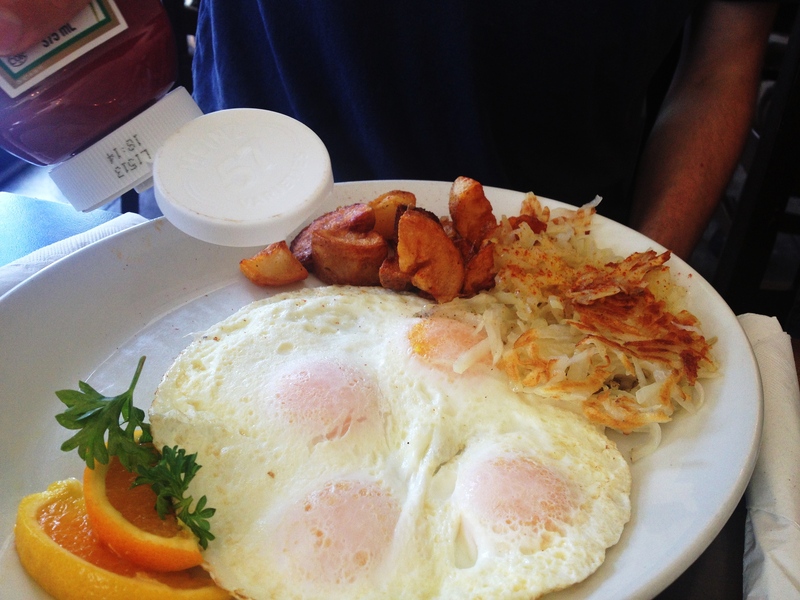 4 Eggs Over Easy – They make it look easy at Figs! 4 eggs over easy and not one broken yolk! 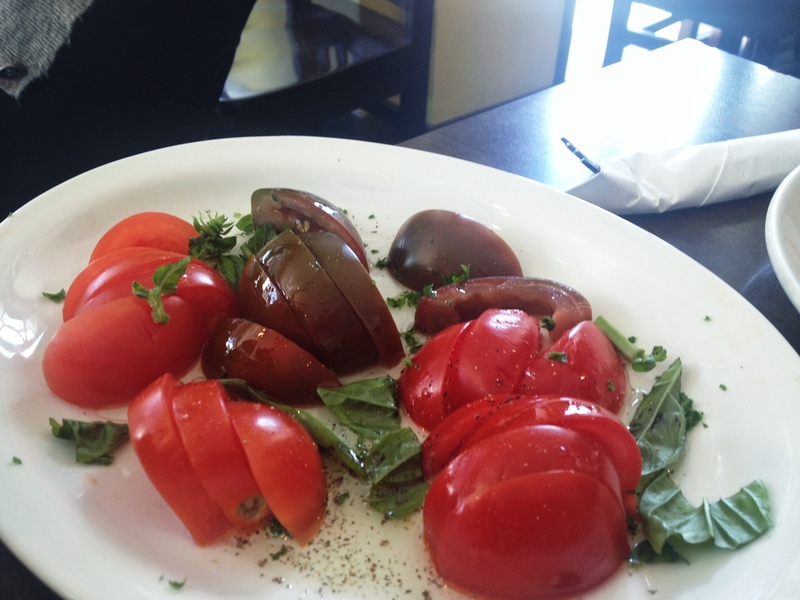 He also had a side of lovely sliced tomatoes and basil (pictured above). I love the colours and how fresh it was! 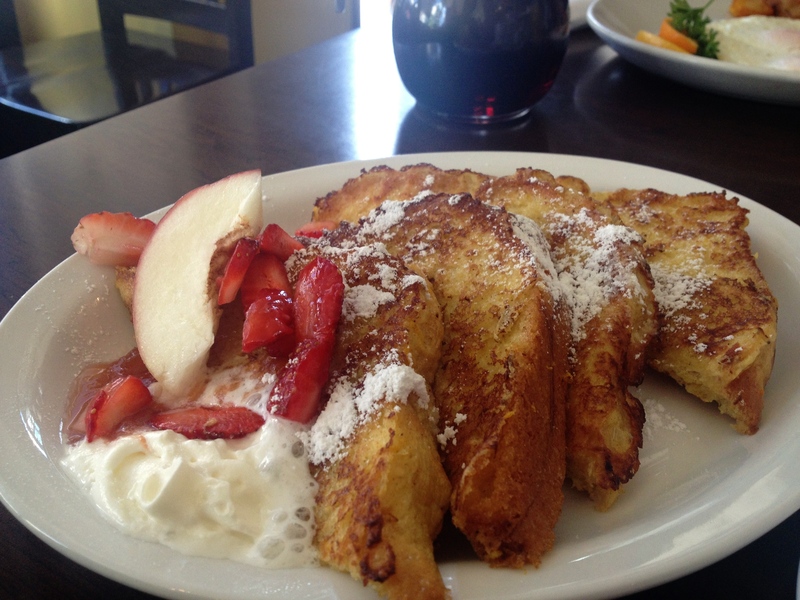 French Toast! Need I say more? Overall, not a bad way to start a Saturday! Everything was tasty and the price right. 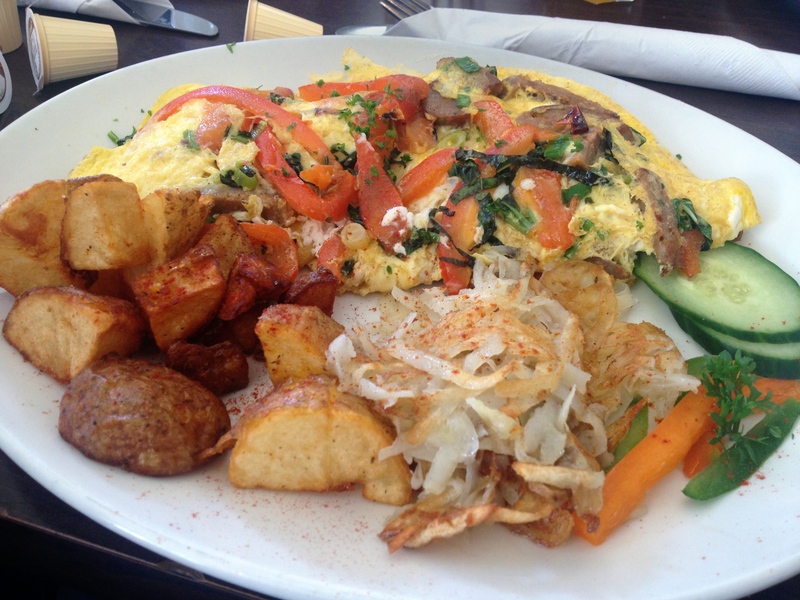 Make sure you stop by Figs on your next excursion in East Toronto! Happy Birthday, KT! Thanks for letting us tag along! Previous PostHello Dolly! Next PostWould the real Squiggy please stand up?